Background: Diagnostic value of multi-slice computed tomography (MSCT) for detecting in-stent restenosis in comparison with conventional coronary angiography remained uncertain. The present study aimed to determine the value of MSCT for detecting in-stent restenosis.Materials and Methods: This historical cohort study was included 226 patients with the history of percutaneous coronary intervention from 2000 to 2014 that referred to MSCT Unit at Alzahra Heart Center in Isfahan. The subjects were followed-up by telephone with regard to performing coronary angiography up to 3 months after MSCT and their status about cardiac events. Results: Among all participants, 63 stents (27.9%) underwent coronary angiography up to 3 months after MSCT that 2 stents in left circumflex artery (LCX) assessment, 2 in left anterior descending (LAD) assessments and none in right coronary artery (RCA) assessment were uninterpretable. Sensitivity, specificity, positive predictive value (PPV), negative predictive value (NPV), and accuracy of MSCT was 92.9%, 66.6%. 92.9%, 66.6%, and 88.2%, respectively for detection of occlusion in LCX stents, 100%, 100%, 100%, 100%, and 100%, respectively for detection of occlusion in LAD stents, and 80.0%, 0.0%, 80.0%, 0.0%, and 66.7%, respectively for detection of occlusion in RCA stents. Overall, MSCT had sensitivity of 93.8%, specificity of 70.0%, PPV of 93.8%, NPV of 70.0%, and accuracy 89.7% for detection of coronary stent restenosis. Conclusion: MSCT has high diagnostic value for detecting in-stent restenosis. Diagnostic accuracy of MSCT for detecting stent restenosis is considerably different between the coronary arteries with the highest diagnostic values for LAD and the lowest diagnostic values for RCA. Coronary artery atherosclerosis is considered one of the most important causes of mortality in the world. Nowadays, with advances in surgical, interventional procedures and cardiac rehabilitation, morbidity and mortality rates due to coronary artery disease (CAD) have significantly declined. Despite the positive role of coronary stents in increasing longevity and improving the quality of life in CAD patients, several complications have been reported related to coronary stents from placement to long-term follow-up. In-stent restenosis is one of the greatest problems in coronary angioplasty with the prevalence rate 11– 46%., The process of in-stent restenosis is based on neointimal hyperplasia that refers to proliferation and migration of vascular smooth muscle cells primarily in the tunica intima, resulting in the thickening of arterial walls and decreased arterial lumen space., This phenomenon can be appeared as one of the two patterns including diffuse with the lesions of >10 mm or focal with smaller lesions. The probability of this event depends on both patient-related factors such as diabetes mellitus and lesion-related factors including length of stenosis, the size of vessel, and the type of revascularization procedures.,, Despite appearing clinical symptoms due to stent restenosis in some affected patients, about half of the patients had no clinical manifestations such as chest pain , and thus the diagnosis of in-stent restenosis is challenging and requires more accurate diagnostic methods. Coronary angiography is one of the accurate and permanent tools for evaluation of coronary stent restenosis. However, the invasive nature of the procedure and patient refusal suggests the need for alternative diagnostic methods. Furthermore, noninvasive modalities such as exercise stress test, stress echocardiography, and scintigraphy could not accurately detect stent restenosis., In this regard, coronary computed tomography angiography (CTA) as a noninvasive and practical tool has created new expectations for assessing stent restenosis because of its high spatial resolution and also high precision tracking. One of the main points regarding accuracy of CTA is the effects of metallic artifacts on limiting its diagnostic accuracy. These artifacts can be appeared from attenuation of the X-ray beam by metal because of its extremely dense structure. Recently, these artifacts can be reduced by iterative reconstruction, resulting in more accurate diagnosis. To our knowledge, there is no previous study regarding the value of CTA for detecting in-stent restenosis in Iran. Furthermore, assessing the diagnostic value of CTA for detecting in-stent restenosis in comparison with coronary angiography showed different results in various studies that may be due to different employed sample sizes and differently conducted study methodologies. By confirming diagnostic value of coronary CTA, this procedure can be used as a noninvasive tool for definitely diagnosing in-stent restenosis. Furthermore, the results of this study could show the rate of restenosis in-stents used in Iran in comparison with studies in other countries. Hence, the present study aimed to determine the value of multi-slice CT (MSCT) for detecting in-stent restenosis in Isfahan, Iran. The secondary endpoint of the study was to evaluate coronary events considering the results of coronary CTA. This historical cohort study was performed on 226 consecutive patients with the history of percutaneous coronary intervention from 2000 to 2014 that referred to MSCT Unit at Alzahra Heart Center in Isfahan for assessing probable occlusion in coronary stents. Lack of consent, in order to continuing the study, was the main exclusion criteria. In this study, all documents related to MSCTs recorded in archives of MSCT unit were reviewed. Then, the subjects were followed-up by telephone with regard to performing coronary angiography up to 3 months after MSCT. All patients who did not experience further assessment by coronary angiography were followed with regard to their status about cardiac events. Cardiac events in this study included every cardiovascular complaint caused hospitalization in our patients. The findings of MSCT were initially reassessed by a radiologist and the results of coronary angiography simultaneously by a cardiologist and then the results of the two modalities were compared. In addition to the findings of two procedures, demographic characteristics, medical history, the branch with a stent, and the time of stent replacement were also determined. In-stent restenosis was defined as more than 50% narrowing of the lumen. The coronary findings in MSCT were categorized as patent [Figure 1], occluded and uninterpretable [Figure 2]. Heart rates of the patients were assessed 1 h before the scan. Patients with a heart rate >60 beats/min received 50– 100 mg metoprolol orally 1 h before MSCT. Patients with anxiety received 0.5 mg alprazolam before the scan. Intravenous propranolol was used to achieve a target prescan heart rate of <60 beats/min for the patients with a heart rate of higher than 60 beats/min at the time of scanning. Sublingual nitrates were used before the procedure. The aforementioned preparation procedure is routine protocol before MSCT of coronary arteries in our center. All scans were performed with a 64-slice MSCT scanner (Medical Health Care GE Work Station RDW 4.3, GE, USA). Technical characteristics of MSCT were as following: 64 mm × 0.5 mm collimation, 350 ms gantry rotation time, kV of 120, and mA of 111. After calcium scanning, a bolus of 80– 100 ml of nonionic iodinated contrast agent (Ultravist-300) followed by 50– 60 ml of normal saline was injected by way of an 18-gauge catheter at 4– 6 ml/s. A dose of 15 ml of contrast was used during the bolus timing scan calculated (by the Apparatus software) at the level of the descending aorta. Seven seconds were added to the calculated time to perform MSCT. To reconstruct the images, the standard built-in retrospectively electrocardiogram-dependent reconstruction algorithm (GE Advantage Windows Workstation 4.3) was used for both native and contrast-enhanced scan. The data reconstruction was performed at 75% of R-R intervals. Additional reconstruction at 25– 85% R-R interval was used to achieve an optimal image quality in cases with low image quality due to motion artifact. The angiographic scan technical parameters were as following: Number of slices per rotation 64 × 1, individual detector width: 0.625 mm, rotation time: 0.33 s, Tube voltage: 120 kVp, and tube current: 320 mA. The reconstructed images were evaluated for coronary artery stent restenosis by an experienced radiologist. Original axial slices, three-dimensional volume rendering images, the maximum intensity projections, multiplanar reconstructions, and linear conformation of the vessels were analyzed to evaluate stent restenosis. A more than 50% reduction in diameter of coronary artery lumen was considered as significant luminal narrowing. Different techniques and cardiac phases, such as wide window levels usage to decrease metallic artifacts, were used to obtain better image quality. Results were presented as a mean ± standard deviation for quantitative variables and were summarized by absolute frequencies and percentages for categorical variables. The sensitivity, specificity, positive predictive value (PPV), negative predictive value (NPV), and accuracy were calculated by cross-tabulation. Overall, 226 patients underwent MSCT to rule out or confirming in-stent restenosis. The average age of participants was 61.37 ± 9.54 years aged 37– 90 years, and 150 patients (66.4%) were male. With regard to the findings of MSCT in term of stent status in each coronary branch [Table 1], 292 stenting was performed in 67 left circumflex artery (LCX), 165 left anterior descending (LAD) artery, 56 right coronary artery (RCA), and 4 left main artery. In this regard, MSCT could show patency and occlusion in 80.6% and 8.9% of LCX, in 81.8% and 11.5% of LAD arteries, in 87.5% and 7.1% of RCAs, and in 75.0% and 25.0% of left main arteries, respectively. Hence, the rate of stent restenosis revealed by MSCT was 8.9% in LCX, 11.5% in LAD, 7.1% in RCA, and 25.0% in LM arteries. Among all participants, 63 (27.9%) underwent coronary angiography up to 3 months after MSCT. 2 LCX stents, and 2 LAD stents were uninterpretable. Considering these cases and compared to the findings of coronary angiography, sensitivity, specificity, PPV, NPV, and accuracy of MSCT was 92.9%, 66.6%. 92.9%, 66.6%, and 88.2%, respectively for detection of occlusion in LCX stents, 100%, 100%, 100%, 100%, and 100%, respectively for detection of occlusion in LAD stents, and 80.0%, 0.0%, 80.0%, 0.0%, and 66.7%, respectively for detection of occlusion in RCA stents. Overall, MSCT had sensitivity of 93.8%, specificity of 70.0%, PPV of 93.8%, NPV of 70.0%, and accuracy 89.7% for detection of arterial stent restenosis [Table 2]. One-hundred twenty patients who did not experience further assessment by coronary angiography were followed by telephone regarding their clinical condition. Nine of them had uninterpretable stents and seven had CT diagnosis of in-stent restenosis. The rest of the patients had patent stents by CT findings. Four patients (two patients with stent restenosis and two patients with a patent stent) had hospital admission because of cardiac complaints. The current study attempted to compare the diagnostic value of MSCT compared to coronary angiography to assess the probability of in-stent restenosis in patients who experienced coronary angioplasty. In fact, although angiography has been agreed as a gold standard for assessing stents with respect to postprocedural restenosis, because of its invasive nature, it is not accepted as a proper diagnostic method. By confirming the value of MSCT to predict occlusion of stents, the approach of using this modality can be considered instead of coronary angiography. In this parallel, our study aimed two important endpoints. First, we assessed the value of MSCT to diagnose stent stenosis and also its patency in comparison with angiography. Second, we assessed the cardiac events in those who did not go for coronary angiography that it means the value of MSCT as a predictive tool to assess the prognosis. In the first step, we could effectively show the high value of MSCT to discriminate patency from occlusion of stents placed in one of the three main coronary arteries. In this regard, the accuracy of MSCT ranged 66.7– 100% for the diagnosis of in-stent restenosis. Almost all previous studies could find similar results regarding diagnostic performance of MSCT angiography. In a study by Chung et al., in-stents that could be assessed, sensitivity, specificity, PPV, and NPV of 64-MSCT were 90.0%, 73.5%, 58.1%, and 94.7%, respectively, but it was also showed that the diagnostic value of MSCT is significantly associated with stent diameter so that evaluation of stents by 64-MSCT is not recommended in-stents with diameters of <2.75 mm or stents located at the left circumflex coronary artery. In a study by Asawa et al., sensitivity, specificity, PPV, and NPV of MSCT were 94.6%, 93.3%, 82.2%, and 98.1%, respectively for detecting stent restenosis that were nearly similar to our results. In another study by Cademartiri et al., sensitivity and specificity of respectively 95% and 93% were observed for the noninvasive detection of coronary in-stent restenosis by MSCT angiography. In addition, an NPV of 99% was observed, suggesting that MSCT might allow reliable exclusion of in-stent restenosis before more invasive procedures such as conventional coronary angiography. Yoshimura et al. showed that the sensitivity, specificity, PPV, NPV, and accuracy for visual evaluation were 78%, 75%, 35%, 95%, and 76%, respectively that was significantly lower than that observed in our survey. Moreover, Andreini et al. revealed that sensitivity, specificity, and accuracy of MSCT for in-stent restenosis identification were 96%, 95%, and 96%, respectively. Nonetheless, as shown in our study, 0.0– 10.5% of stents primarily remained uninterpretable that was significantly lower than that reported previously. Hence, in Schuijf et al. study 23% of the included stents were uninterpretable. Overall, reviewing the literature shows a range of 75.0– 100% for sensitivity and 86.0– 100% for the specificity of MSCT to detect occlusion in-stents.,,,,,, Although they introduced this rate of uninterpretable stents as a main limitation of MSCT for assessment of in-stent restenosis, but according to our results, uninterpretable stents are rare with proper techniques of image acquisition and processing such as high rate of contrast injection, lower heart rates, and sharp kernel reconstructions. The contradictory observations in different studies are mainly related to various factors such as type and also the size of stents. In the study by Schuijf et al. 28% of stents with a diameter ≤3.0 mm, but only 10% of stents with a diameter of >3.0 mm were uninterpretable. Gaspar et al. found that in CT, all stents with a mean stent diameter of 3.3 mm were evaluable. However, only 72% of in-stent restenosis were detected. 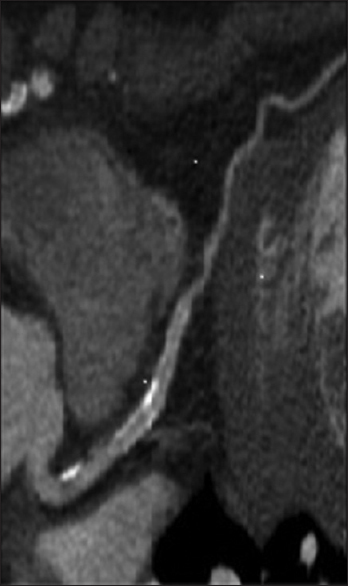 Unfortunately, the present study ignored the size of diameter as a confounder in the assessment of stent restenosis. However, considering high stenosis detection rate by using MSCT in our study may suggest selecting larger size stents in the present study. The stent-related patency rate may be affected by the type of occluded coronary artery and by the anatomical location of the stent in the artery. However, other unknown factors influencing long-term patency rate of stents should be assessed in further studies. As shown in our study, the diagnostic accuracy of MSCT for detecting stent restenosis is considerably different between the coronary arteries with the highest diagnostic values for LAD and the lowest diagnostic values for RCA. Different types of stents have different alloy and strut thickness that may affect the image quality and intensity of noise, as in our experience older generation stents with thicker struts create more artifact and are more difficult for interpretation. Limitations of our study include; the number of cases and lack of data regarding the size and type of stents. Future perspective and recommendations: In future by introduction of new generation MSCT systems with less limitation in heart rate and combining CT perfusion and fractional flow reserve CT there is a real hope that accuracy of CT for detecting in-stent restenosis would be even better. Our study shows the high value of MSCT to predict in-stent restenosis with high sensitivity and specificity regardless of the type of coronary artery. Fischman DL, Leon MB, Baim DS, Schatz RA, Savage MP, Penn I, et al. A randomized comparison of coronary-stent placement and balloon angioplasty in the treatment of coronary artery disease. Stent Restenosis Study Investigators. N Engl J Med 1994;331:496-501. Jensen JK, Jensen LO, Terkelsen CJ, Lassen JF, Tilsted HH, Hansen KN, et al. Incidence of definite stent thrombosis or in-stent restenosis after drug-eluting stent implantation for treatment of coronary in-stent restenosis: From Western Denmark Heart Registry. Catheter Cardiovasc Interv 2013;81:260-5. Kornowski R, Hong MK, Tio FO, Bramwell O, Wu H, Leon MB. In-stent restenosis: Contributions of inflammatory responses and arterial injury to neointimal hyperplasia. J Am Coll Cardiol 1998;31:224-30. Shah PK. Inflammation, neointimal hyperplasia, and restenosis: As the leukocytes roll, the arteries thicken. Circulation 2003;107:2175-7. Chen J, Chen Y, Tian F, Han Y, Jing J, Liu J, et al. Predictors of in-stent restenosis in coronary heart disease patients complicating with diabetes mellitus within 2 years after drug-eluting stents implantation. Zhonghua Xin Xue Guan Bing Za Zhi 2014;42:14-8. Cassese S, Byrne RA, Tada T, Pinieck S, Joner M, Ibrahim T, et al. Incidence and predictors of restenosis after coronary stenting in 10 004 patients with surveillance angiography. Heart 2014;100:153-9. Schukro C, Gruska M, Syeda B, Winkler M, Poradek T, Sipötz H, et al. Duration of development of symptomatic in-stent restenosis correlates with the stent-to-vessel-diameter ratio: An intravascular ultrasound study. Coron Artery Dis 2007;18:507-12. Dangas G, Kuepper F. Cardiology patient page. Restenosis: Repeat narrowing of a coronary artery: Prevention and treatment. Circulation 2002;105:2586-7. Yang ZY, Wang Q, Guo SX, Zhang Y, Fang XM, Cui ZM. Value of detecting in-stent restenosis by dual source coronary computed tomography coronary angiography. Zhonghua Xin Xue Guan Bing Za Zhi 2011;39:49-52. Galassi AR, Marzá F, Azzarelli S, Tomasello SD. Role of stress myocardial scintigraphy in the evaluation of incompletely revascularized post-PCI patients. Int J Mol Imaging 2011;2011:180936. Elhendy A, Tsutsui JM, O'Leary EL, Xie F, Majeed F, Porter TR. Evaluation of restenosis and extent of coronary artery disease in patients with previous percutaneous coronary interventions by dobutamine stress real-time myocardial contrast perfusion imaging. Heart 2006;92:1480-3. Oncel D, Oncel G, Karaca M. Coronary stent patency and in-stent restenosis: Determination with 64-section multidetector CT coronary angiography – Initial experience. Radiology 2007;242:403-9. Van Mieghem CA, Cademartiri F, Mollet NR, Malagutti P, Valgimigli M, Meijboom WB, et al. Multislice spiral computed tomography for the evaluation of stent patency after left main coronary artery stenting: A comparison with conventional coronary angiography and intravascular ultrasound. Circulation 2006;114:645-53. Rief M, Zimmermann E, Stenzel F, Martus P, Stangl K, Greupner J, et al. Computed tomography angiography and myocardial computed tomography perfusion in patients with coronary stents: Prospective intraindividual comparison with conventional coronary angiography. J Am Coll Cardiol 2013;62:1476-85. Erratum in: J Am Coll Cardiol 2014;63:944. Chao SP, Law WY, Kuo CJ, Hung HF, Cheng JJ, Lo HM, et al. The diagnostic accuracy of 256-row computed tomographic angiography compared with invasive coronary angiography in patients with suspected coronary artery disease. Eur Heart J 2010;31:1916-23. Sajjadieh A, Hekmatnia A, Keivani M, Asoodeh A, Pourmoghaddas M, Sanei H. Diagnostic performance of 64-row coronary CT angiography in detecting significant stenosis as compared with conventional invasive coronary angiography. ARYA Atheroscler 2013;9:157-63. Chung SH, Kim YJ, Hur J, Lee HJ, Choe KO, Kim TH, et al. Evaluation of coronary artery in-stent restenosis by 64-section computed tomography: Factors affecting assessment and accurate diagnosis. J Thorac Imaging 2010;25:57-63. Asawa K, Ueda H, Kido A. Abstract 14825: Assessment of coronary artery stent restenosis using 256-multislice computed tomography (256-MSCT): Factors affecting assessment and accurate diagnosis using clinical data and phantom study. Circulation 2014;124:A14825. Cademartiri F, Schuijf JD, Pugliese F, Mollet NR, Jukema JW, Maffei E, et al. Usefulness of 64-slice multislice computed tomography coronary angiography to assess in-stent restenosis. J Am Coll Cardiol 2007;49:2204-10. Yoshimura M, Nao T, Miura T, Okada M, Nakashima Y, Fujimura T, et al. New quantitative method to diagnose coronary in-stent restenosis by 64-multislice computed tomography. J Cardiol 2015;65:57-62. Andreini D, Pontone G, Mushtaq S, Bartorelli AL, Bertella E, Trabattoni D, et al. 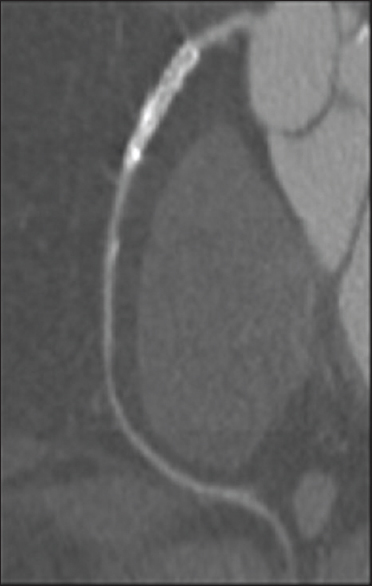 Coronary in-stent restenosis: Assessment with CT coronary angiography. Radiology 2012;265:410-7. Schuijf JD, Bax JJ, Jukema JW, Lamb HJ, Warda HM, Vliegen HW, et al. Feasibility of assessment of coronary stent patency using 16-slice computed tomography. Am J Cardiol 2004;94:427-30. Rixe J, Achenbach S, Ropers D, Baum U, Kuettner A, Ropers U, et al. Assessment of coronary artery stent restenosis by 64-slice multi-detector computed tomography. Eur Heart J 2006;27:2567-72. Rist C, von Ziegler F, Nikolaou K, Kirchin MA, Wintersperger BJ, Johnson TR, et al. Assessment of coronary artery stent patency and restenosis using 64-slice computed tomography. Acad Radiol 2006;13:1465-73. Ehara M, Kawai M, Surmely JF, Matsubara T, Terashima M, Tsuchikane E, et al. Diagnostic accuracy of coronary in-stent restenosis using 64-slice computed tomography: Comparison with invasive coronary angiography. J Am Coll Cardiol 2007;49:951-9. Manghat N, Van Lingen R, Hewson P, Syed F, Kakani N, Cox I, et al. Usefulness of 64-detector row computed tomography for evaluation of intracoronary stents in symptomatic patients with suspected in-stent restenosis. Am J Cardiol 2008;101:1567-73. Hecht HS, Polena S, Jelnin V, Jimenez M, Bhatti T, Parikh M, et al. Stent gap by 64-detector computed tomographic angiography relationship to in-stent restenosis, fracture, and overlap failure. J Am Coll Cardiol 2009;54:1949-59. Pugliese F, Weustink AC, Van Mieghem C, Alberghina F, Otsuka M, Meijboom WB, et al. Dual source coronary computed tomography angiography for detecting in-stent restenosis. Heart 2008;94:848-54. Gaspar T, Halon DA, Lewis BS, Adawi S, Schliamser JE, Rubinshtein R, et al. Diagnosis of coronary in-stent restenosis with multidetector row spiral computed tomography. J Am Coll Cardiol 2005;46:1573-9.